1970　Shuhei graduated from Ritsumeikan University in 1970. Studied under Mitsuo Tanimoto. 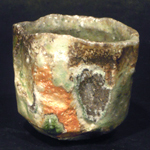 1975　He built his own kiln in Ueno City, Mie. 1987　Start holding both solo and group exhibitions. 1995　Joined the 4th International Contemporary Art Festival and held a solo exhibition.